You know you are more than likely in need of an electrician when you flick a switch and nothing happens. This happens to all of us every now and again and even though it is frustrating to no end, you still have a quick solution when you are stuck mid-in this kind of scenario. You get onto your phone and call the electrician that you have trusted to take care of your issue as soon as it arises. If the company you call isn’t Randwick Electrical, you may want to rethink the number. Try these guys and see how they compare to the company you usually deal with. Chances are you will not want anyone else to take care of your electrical issues after seeing what they do. 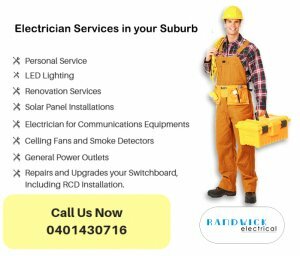 If you need to be convinced that Randwick Electrical is the best for finding an electrician Randwick and the surrounding areas trust to deliver quality service, you should read through our testimonials to see how many happy clients we have had with our electrician Randwick in the past. Apart from the fact that they can and will fix any electrical appliance or piece of equipment and even wiring, they are also specialist when it comes to solar power. Finding an Electrician Bondi and electrician eastern suburbs are a few other areas have used for advice and installation of solar systems cannot be easier than asking Ryan. Because we are a company of only a few individuals, they offer personal service which means the electricians will more often than not be the same ones every time. This ensures that we will get to know your home, the wiring and its circuitry like the backs of their hands and due to this they will have a good idea where to start looking if a problem arises. The job will be done quickly because of this allowing you to go on with business as usual. The fact that they are a smaller company also means that they have smaller overheads so they generally charge less than a bigger company would. Find another electrician eastern suburbs get their excellent electrical services from and you will also find a field of four leaf clovers as service such as this is as rare as chicken teeth. Getting an electrician Maroubra businesses use to make sure their electrical problems gets sorted in no time you do not need to look further than Randwick Electrical. We have extensive experience in upgrading and repairing switchboard systems and in so doing eliminating the fire risk it may pose. They consider RCD safety switches to be essential to ensure you or a family or staff member doesn’t get electrocuted due to outdated circuit breakers or fuses. People often overlook their switchboards when upgrading their wiring systems and it could be a very expensive and life threatening oversight but because these guys are pros they will help you keep your switchboard up to date too.